A funny thing happened at the dinner table tonight. It has been suggested that woman may get the vote, can you believe that! A funny thing happened at the dinner table tonight. It has been suggested that woman may get the vote, can you believe that ! This conversation would have taken place just over a hundred years ago in England before woman had the vote and would have been prompted by this tiny silver pepperrette on the dining table itself. 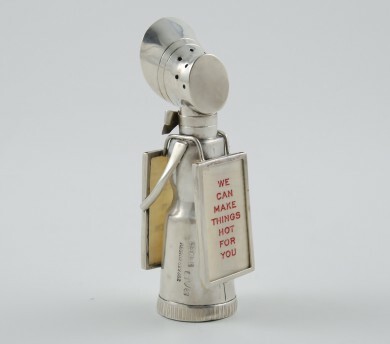 This small silver masterpiece stands 8,5 centimeters high but it’s message would have been loudly shouted out to all who sat for dinner. The aim of the silversmiths was to produce a common object that would have been topical and stimulated conversation. 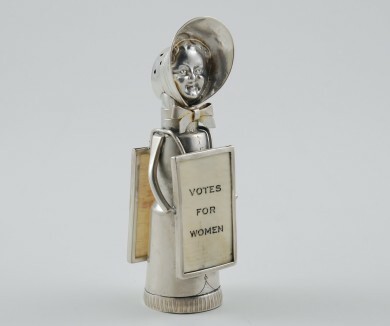 Made in Chester and hallmarked for 1908 this Suffragette pepper, complete with sandwich boards, is by Saunders & Shepherd. The front board has the slogan “Votes for Woman” which was a double entendre as there was a weekly newspaper ‘Votes for Woman’ published by the Women’s Social and Political Union (W.S.P.U) as well demanding that woman should now get the vote. The other board is stamped “We can make things hot for you” and this double entendre would have referred to the aim of the W.S.P.U. This was to publicize their cause through actions such as mass demonstrations in order to ruffle the social status quo. The other meaning would have referred to the spicy pepper inside. Suffragette derives from the word suffrage meaning the right to vote. In Edwardian Britain woman did not have this right. In 1903 Emmeline Pankhurst founded the W.S.P.U in order to promote woman’s suffrage. She along with her daughters Christabel and Sylvia believed that in order to accomplish this they would have to become radical and militant. They spent time in jail for their beliefs and images of suffragettes parading outside parliament and chaining themselves to the railings at Downing Street and Buckingham Palace aroused much emotion. 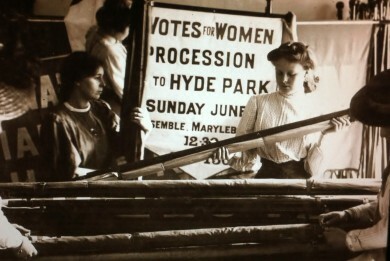 This picture taken at the Museum of London from their fascinating Suffragette exhibition shows preparations for a suffragette march where on Woman’s Sunday in June 1908 a crowd of 300 000 people turned out to watch suffragettes march through London to Hyde Park. 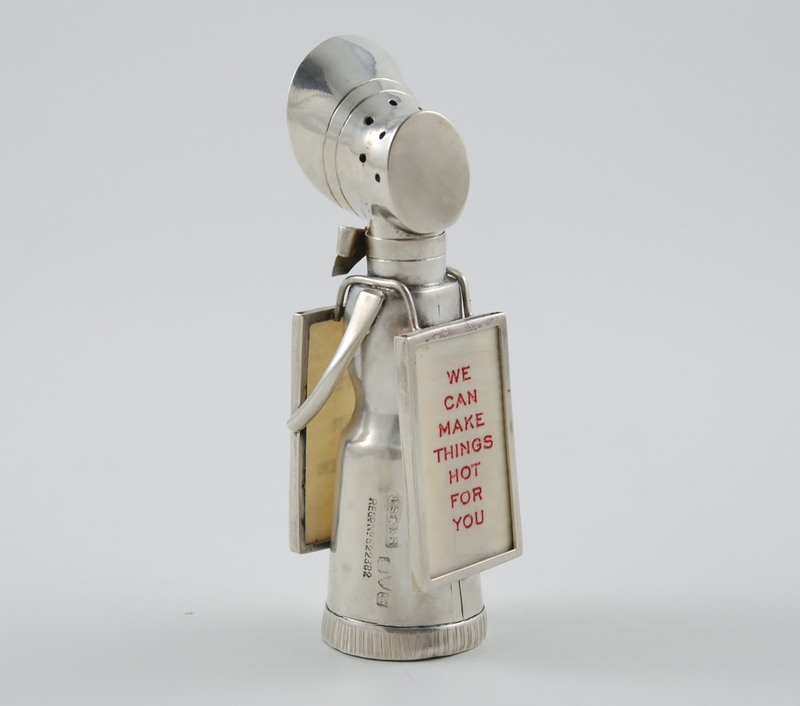 A simple pepper pot made early on in the movement to attain voting rights would have aroused much comment at the dinner table, both for and against allowing woman the right to vote. It was not until 1918 that woman over the age of 30 were given this right and in 1928 this was moved to 18. Today in South Africa as we go to the polls everyone has the right to vote and this democratic process where all can be heard should always be celebrated.